The European Space Agency/NASA Solar and Heliospheric Observatory, or SOHO, captured this image of a gigantic coronal hole hovering over the sun’s north pole on July 18, 2013, at 9:06 a.m. EDT. The European Space Agency/NASA Solar and Heliospheric Observatory, or SOHO, captured this image of a gigantic coronal hole hovering over the sun’s north pole on July 18, 2013, at 9:06 a.m. EDT. Coronal holes are dark, low density regions of the sun’s outermost atmosphere, the corona. They contain little solar material, have lower temperatures, and therefore, appear much darker than their surroundings. Coronal holes are a typical feature on the sun, though they appear at different places and with more frequency at different times of the sun’s activity cycle. The activity cycle is currently ramping up toward what is known as solar maximum, currently predicted for late 2013. During this portion of the cycle, the number of coronal holes decreases. During solar max, the magnetic fields on the sun reverse and new coronal holes appear near the poles with the opposite magnetic alignment. The coronal holes then increase in size and number, extending further from the poles as the sun moves toward solar minimum again. 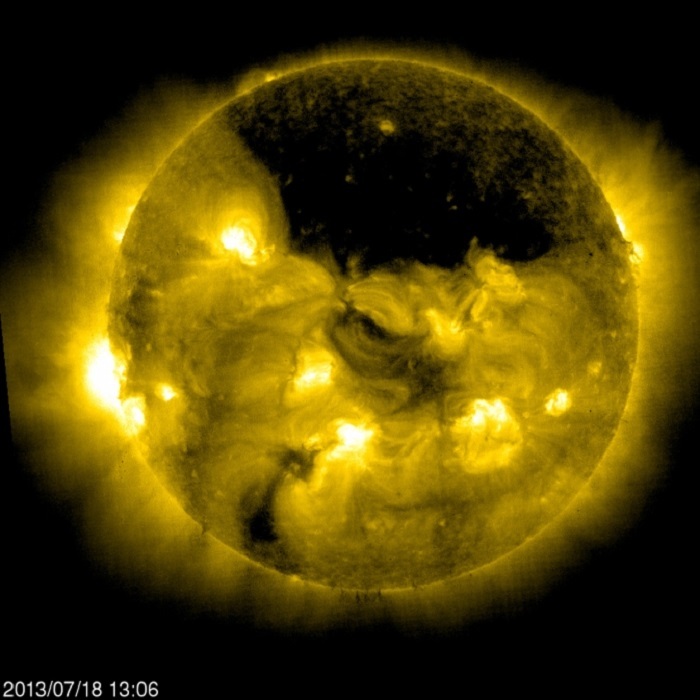 At such times, coronal holes have appeared that are even larger than this one. The holes are important to our understanding of space weather, as they are the source of a high-speed wind of solar particles that streams off the sun some three times faster than the slower wind elsewhere. While it’s unclear what causes coronal holes, they correlate to areas on the sun where magnetic fields soar up and away, failing to loop back down to the surface, as they do elsewhere.